Gaines was the 683rd person killed by the police since January 1st. Korryn Gaines, as a black woman and a freedom fighter, was deemed a threat to the system. The police had been harassing Gaines in the weeks and months leading up to the murder. The police justified the murder by claiming that she was a threat due to being armed. However, to the right­wing gun ownership advocates, the 2nd amendment does not apply to black people, especially black women. The murder has been met on one hand by victim blaming by anti­black racists, and on the other hand by mass, militant action lead by Black Lives Matter activists and community members. These militant actions are being lead nation wide by black women and femmes who are tired of the larger Black Lives Matter movement ignoring the violence against them. Black women are also killed by the police, in addition to facing sexual assault and racial profiling. For example, sexual misconduct is the second most prevalent complaint against police departments behind excessive force. National Students for Democratic Society stands with all victims of racist police terror. We must Say Her Name, and uplift the revolutionary spirit of black women and femmes. We believe that Gaines had every right to arm herself, especially given that the police had been tormenting her for quite a while. We know that Gaines was targeted for being a black woman and an activist, and that this history of harassment is evidence that this killing was part of a deliberate effort by the police to neutralize what they decided was a threat. SDS understands that this murder is a part of a pattern of racist terror carried out by the police, as the police force is an armed wing of white supremacy and national oppression. 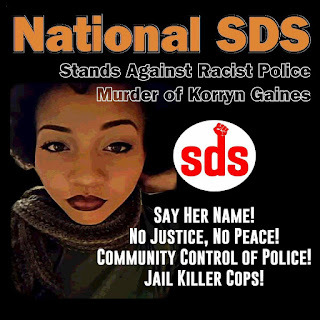 National SDS stands against racism, white supremacy, and national oppression in all its forms, including its particular manifestation in police brutality, especially against black women and femmes. We support the demands of black and brown communities for democratic control of the police force, such as Civilian Police Accountability Councils and disciplinary action against police; we also stand in solidarity with the masses of people rising up against police terror. SDS promotes the right of all oppressed nations to sovereignty and independence, and works to build movements for liberation.